You make a great batch of ice cream, toss in some berries at the end, and then realize upon eating it that those amazing berries are now essentially fruit ice cubes. Let's fix that. 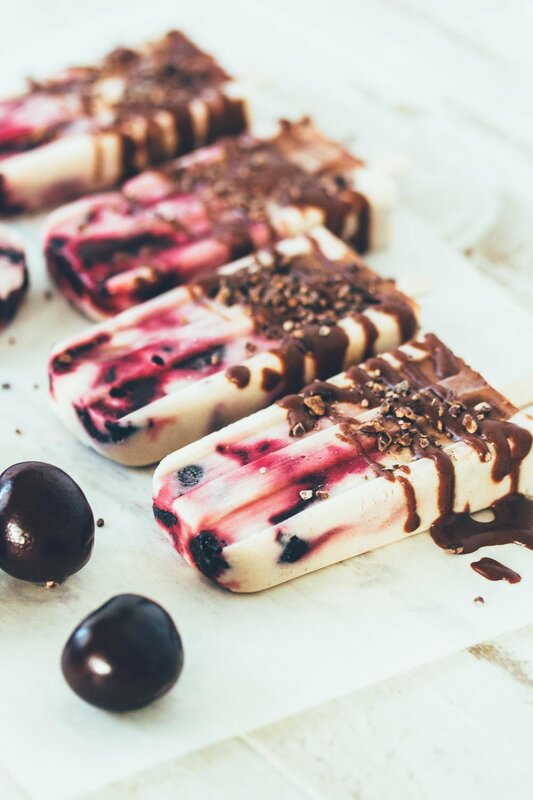 If you’ve experimented with homemade ice cream or popsicles, you might’ve learned that fresh fruit doesn’t freeze as nicely as you’d hope. You make a great batch of ice cream, toss in some berries at the end, and then realize upon eating it that those amazing berries are now essentially fruit ice cubes. Roasting removes much of the water content (which is what turns the fruit into an ice cube in the first place) so that what you’re left with is concentrated flavor AND sweetness. You get the fruit flavor in your frozen goods that you were hoping for and as a bonus, with no added sugars needed. If your threshold for sweetness is on the low side, the roasted cherries will be enough to hold you through without adding the other sweeteners listed here (the dates and maple syrup). Or if you’re hoping to keep carb counts down without sacrificing too much sweetness, go for a combo of the listed sweeteners and a bit of stevia. Taste each layer and adjust to your personal preference. It’s a flexible recipe that will be delicious any way you approach it. Keep in mind, the hearty amount of fats here will provide a lot of satiety. This means less sweetness is needed for these to be thoroughly enjoyable! Preheat the oven to 425F. Pit the cherries (I prefer to just tear them in half with my fingers, gloves are optional😝). Toss the cherries on a large sheet pan with the lemon juice and avocado oil. Bake for 20 minutes, or until the cherries are soft and syrupy. Allow them to cool to room temperature. Set aside 1/4 cup of the coconut milk for the chocolate layer. Add the remaining coconut milk, medjool dates, vanilla extract, almond extract, and nutmeg to a blender. Blend on high until smooth and no more date pieces are visible. Make the chocolate layer by whisking the remaining coconut milk with the coconut oil, cacao powder, maple syrup, vanilla extract, and sea salt in a glass measuring cup with a spout. Assemble the popsicles by dividing the roasted cherries between the 10 popsicle cavities (I prefer this mold). Then fill the cavities with the coconut milk layer to about 2/3 full. Use a knife to gently stir the cherries and create a swirl effect. Lastly, portion the chocolate between the cavities. Freeze 6+ hours, or until solid. Serve with the optional toppings, as desired.